Here’s a general rule: if you want a happy Tess, put her on a bike in the countryside, let her raz around the woods, or take on the trails. There’s literally nothing better than the freedom and space that mountain biking gives me. It’s my drug and I want more now, please. There are no secrets here, everyone knows I love cycling. If you follow me on Instagram, Twitter or Facebook, you’ll know I proper full on love riding my mountain bike and am always on the hunt for new adventures. 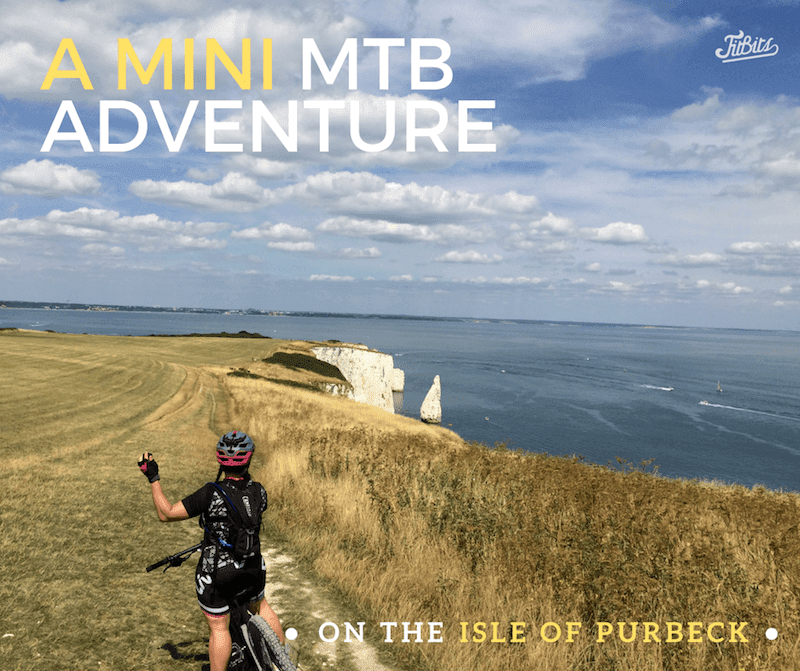 So when Marmalade MTB advertised another Isle of Purbeck day trip in the middle of this glorious heatwave I knew we had to go. Me and Chris were camping in the van when I saw it pop up on Instagram and I booked it there and then on my phone. The mini-adventure starts at the Boatyard Cafe in Poole for breakfast before boarding the ferry for the short crossing. It’s the shortest boat crossing I’ve ever been on actually, at only five or ten minutes, and it took me to the most wonderful, happy-giving place you could ever ride your bike. The boat (which takes cars, bikes, humans, maybe pets?) docks beside a gorgeous sandy beach – the kind that makes you go ‘wow’ if like me, you’ve only ever seen one for real a few times in your life. 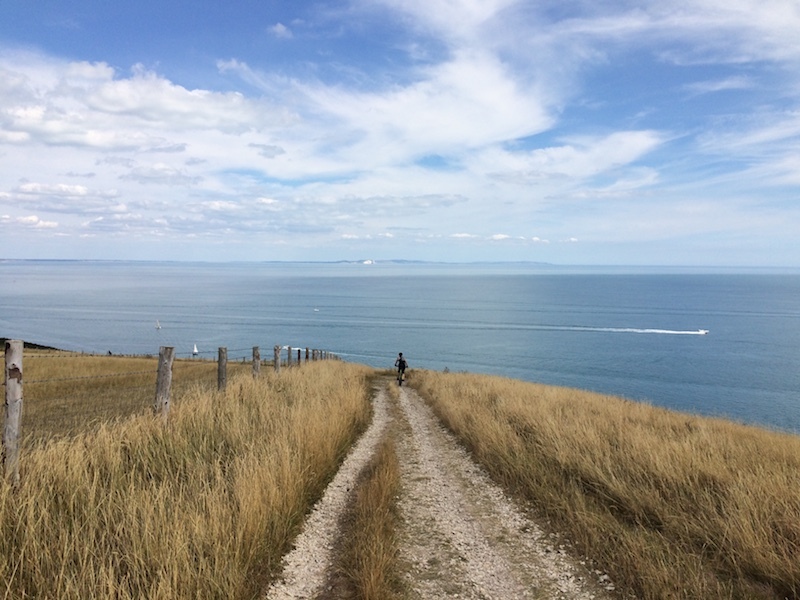 We slathered on the suncream and cycled up the road onto a bridleway that would take us high up into the Purbeck Hills. The heat was immense so we took a wee shortcut across the heath to begin the climb and limit time out in the open. It was at this point, after a bit of faffing adjusting my gears that we realised my cable had snapped and I could only get into my smaller ring. Luckily, this was the right ring to be stuck in, for all those lovely hills. The climbs were brilliant, by the way. I know I’m not the only cyclist to love a good climb – toughing it out to the top makes the descents all the more worth it, apart from anything else. For me though it’s more than that, I actually enjoy riding the hills. The sweat that drips into your eyes, the breath you can’t get into your lungs, the burn in your legs as you try to keep a good rhythm. 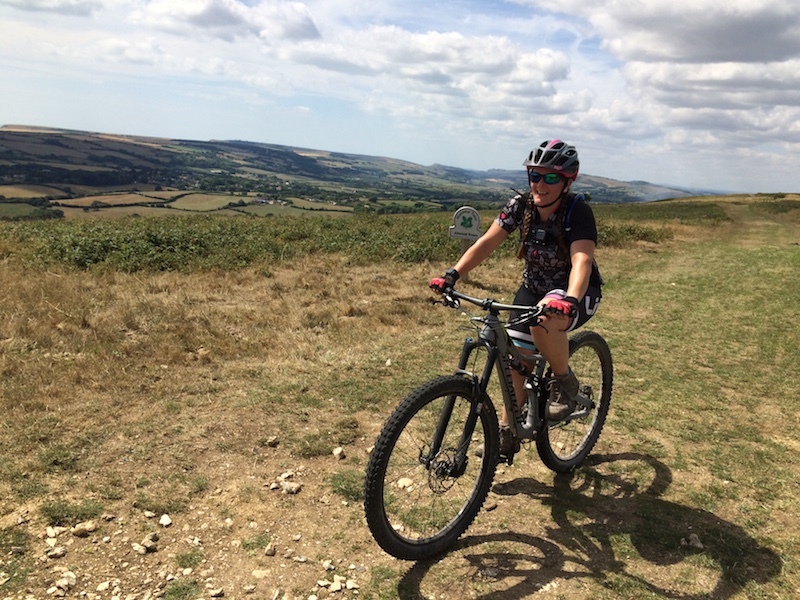 I’m feeling really strong on the bike at the moment – well, mountain bike anyway, need to get stronger on the road as it’s only six weeks to VeloSouth – more on that later! So yeah, these climbs. Up onto the wide open plains of Purbeck with views out to sea from most sides. A glorious descent down to Corfe Castle to shovel in scones and snacks before smashing the climb back up and along to Old Harry Rocks. Beautiful Old Harry. The words ‘wow’, ‘stunning’ and ‘amazing’ escaped my lips at every twist and turn on this ride. My legs felt strong, my lungs were full and so was my heart. I felt like I flew up the hills and soaked it all up on the descents. 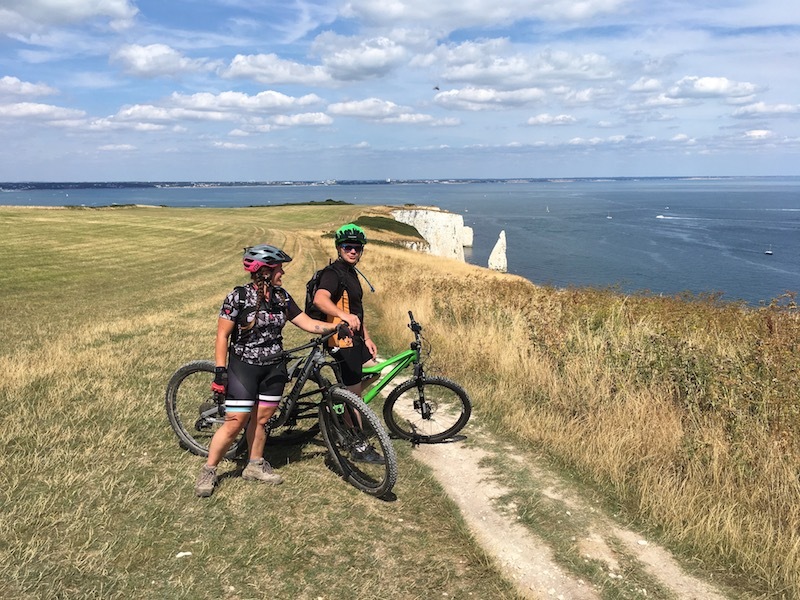 The views were phenomenal and we stopped numerous times for photos and communal ‘wow’s’ – something I was particularly happy for as I never get photos of me on the bike, and it’s nice to have other people taking them as well as me! 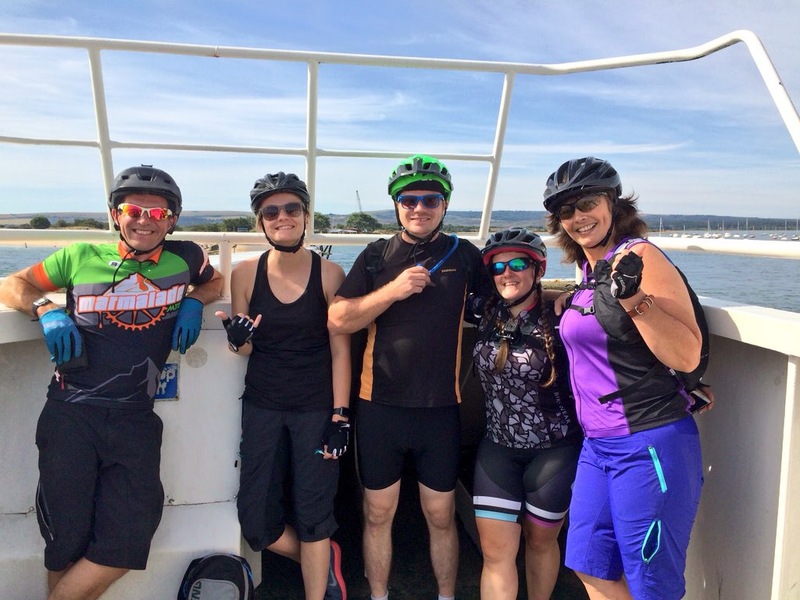 After marvelling at Old Harry we descended back down to Poole and jumped on the boat for a post-ride beer right back where we started, on the very same table we had sausage sandwiches only a few hours before. I don’t know if it was the weather, the company, the strength in my legs, the scenery, or all of it combined, but it really was an incredible trip and such a mini adventure. One I’d never think to do on our own, not just because we wouldn’t know the route but because we wouldn’t think to drive two or more hours for a ride in a day. But why not? It’s totally doable and now we’re looking at other places to ride for similar adventures. 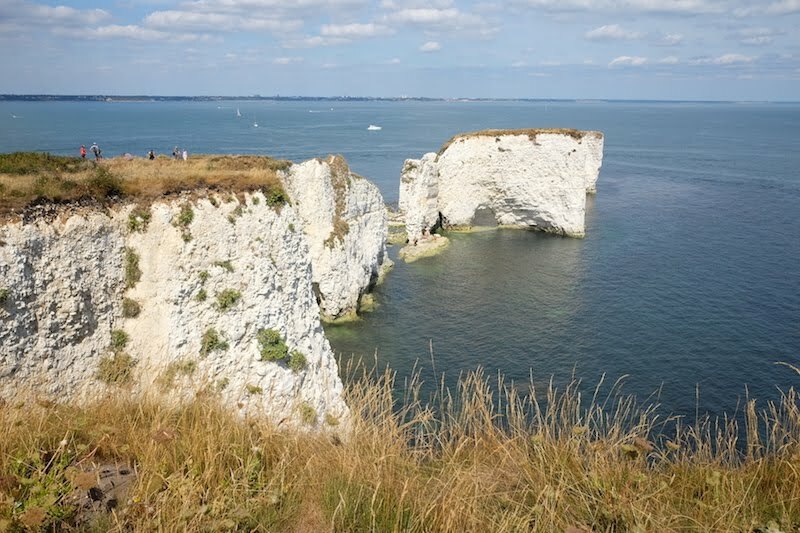 I’m pretty sure we’ll be back to Purbeck not just to ride but also to see the Castle and sit on that gorgeous beach. What else is there to see/do in that area? 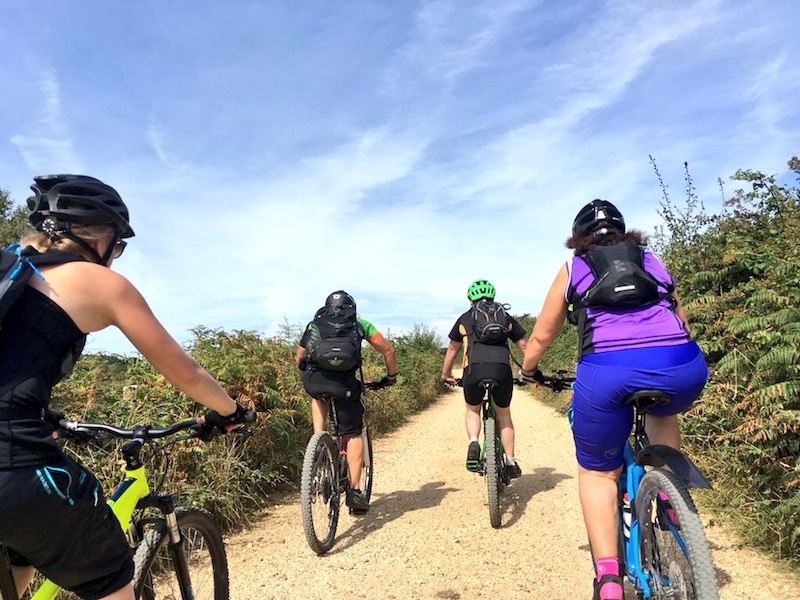 If you fancy a taste of these endorphins, find out more about the trip and other rides from the marvellous Marmalade MTB. * Disclaimer: We paid for our places on this incredible trip and it was worth every penny – book yours here.